In many respects, the style of warfare depicted in the Book of Mormon is quite different from the mode of war familiar to most Americans in Joseph Smith’s day. One notable example is the starkly realistic account of guerrilla warfare found in the books of Helaman and 3 Nephi. During the 19th century, it was commonly expected that opposing troops would formally array themselves for battle and engage in an all-out contest on a set-piece battlefield. Guerrilla warfare, on the other hand, operates on the principles of stealth, surprise, hidden base camps, small-scale skirmishes, strategic retreats, advantageous terrain, and—importantly—propaganda. These types of tactics, although foreign and even shameful to 19th-century thinking, were used repeatedly by the Gadianton robbers of the Book of Mormon. Like many other revolutionaries, the Gadianton robbers started out as a marginalized political group. After the “voice of the people” sided against them and their secret band was discovered, “they took their flight out of the land, by a secret way, into the wilderness” (Helaman 2:2, 11). Years later, Nephite dissenters revived Gadianton’s “secret plans” and began to wage an extended war with the Nephites (Helaman 11:26). We are told that “they did commit murder and plunder; and then they would retreat back into the mountains, and into the wilderness and secret places, hiding themselves that they could not be discovered, receiving daily an addition to their numbers, inasmuch as there were dissenters that went forth unto them” (Helaman 11:25). As is the case in most historical examples, the robbers’ hit-and-run guerrilla tactics worked exceptionally well against the more stationary Nephites and their regular armies (Helaman 11:27–33). Like those who later faced Marxist insurgencies in Cuba, China, and Vietnam, the Nephite and Lamanite authorities had to do something. They could not simply sit back and tolerate the depredations their Gadianton enemies practiced upon them. But they would learn, as would the French, the Americans, Batista y Zaldívar, Chiang Kai-shek, and General Westmoreland, that guerrilla forces are extraordinarily difficult to defeat and virtually impossible to dislodge from their chosen territory. Not only were the robbers difficult to root out militarily, but they were hard to counter politically. According to military historian and Brigadier General Samuel Griffith, “Guerrilla leaders spend a great deal more time in organization, instruction, agitation, and propaganda work than they do fighting, for their most important job is to win over the people.” This agenda is clearly present in the behavior of the Gadianton robbers. On some occasions they almost seemed to “have become extinct,” (Helaman 11:10), but apparently they were just biding their time, mingling among the people, secretly promoting their cause, and recruiting dissidents until they had enough support to wage another promising insurgency (vv. 24–34). A firsthand glimpse of the political savviness of the Gadianton robbers can be seen in a letter from one of their leaders, Giddianhi. His epistle to Lachoneus attempts both to flatter and intimidate the Nephite governor and his soldiers. After inviting the Nephites to “unite with us and become acquainted with our secret works,” Giddianhi threatened to completely destroy them within a month if they didn’t submit (3 Nephi 3:7–8). Yet, like a number of guerilla forces throughout history, these robbers transitioned into standard pitched-battle tactics too soon. The Nephites’ first impulse was to “fall upon the robbers and destroy them in their own lands” (3 Nephi 3:20). But their prophetic chief captain, Gidgiddoni, warned them that such a course would lead to disaster—both militarily and spiritually. Instead, he proposed that “we will prepare ourselves in the center of our lands, and we will gather all our armies together, and we will not go against them, but we will wait till they shall come against us” (v. 21). This also involved gathering together their food and animals, leaving their lands completely desolate, in order to weather the siege (v. 22). This tactic reversed the strategy that the robbers had been using against the Nephites all along. According to Peterson, “Gidgiddoni would force the Gadianton armies to attack the Nephites in the Nephites’ own strongholds. Nephite fortified cities would effectively take the place of mountain base camps. … By yielding up territory in a classic ‘strategic retreat,’ he was, to borrow Mao’s phrase, ‘luring the enemy in deep.’” The robbers ran out of food, could not besiege the city, and decisively lost the battle (3 Nephi 4:1–14). In basic principles as well as nuanced subtleties, the Book of Mormon’s depiction of guerrilla warfare is stunningly authentic. Peterson described it as “a totally believable and coherent complex of military behaviors and responses.” This feature of the Book of Mormon is especially remarkable because it is so out of place coming from a 19th century farmer like Joseph Smith. goes considerably beyond anything Joseph Smith would have been likely to create out of his own imagination. It is not simply the Book of Mormon’s precise portrayal of irregular warfare that is foreign to Joseph and his environment. Its realistic and wholly unromantic military narratives do not, it seems clear to me, come from the mind of that Joseph Smith, who, while he abhorred actual battle, loved parades and military pageantry, relished his commission as Lieutenant-General of the Nauvoo Legion, and, uniformed in elegant blue and gold, liked nothing better than to review the troops while mounted on his black stallion, Charlie. These findings provide good evidence that Joseph Smith was a true prophet. It also indicates that the Book of Mormon’s account of secret combinations and their guerrilla efforts to destabilize and destroy governments is no idle tale. In fact, we are seeing it play out again before our own eyes as terrorist groups throughout the world seek to secretly recruit armies and topple governments. Concerning the Nephites’ conflict with the robbers, political science professor Ray C. Hillam has noted, “It was not simply a contest of arms but of ideas.” The same is certainly true in our day as well. If the most important goal of modern-day Gadianton robbers is, as Griffith put it, to “win over the people,” then there is something that each of us can do. We can unite together, live the gospel, and share its joy and goodness with the world. For, as we learn in Alma 31, the word of God “had more powerful effect upon the minds of the people than the sword, or anything else, which had happened unto them” (Alma 31:5). See Stephen D. Ricks and William J. Hamblin, eds., Warfare in the Book of Mormon (Salt Lake City and Provo, UT: Deseret Book and FARMS, 1990). For a study of similar groups, see Kent P. Jackson, “Revolutionaries in the First Century,” in Masada and the World of the New Testament, ed. John F. Hall and John W. Welch (Provo, UT: BYU Studies, 1997), 129–140; John W. Welch, “Legal and Social Perspectives on Robbers in First Century Judea,” in Masada and the World of the New Testament, 141–153; John W. Welch and John F. Hall, Charting the New Testament (Provo, UT: FARMS, 2002), chart 3–12; Daniel C. Peterson, “Exploratory Notes on the Futuwwa and Its Several Incarnations,” in Bountiful Harvest: Essays in Honor of S. Kent Brown, ed. Andrew C. Skinner, D. Morgan Davis, and Carl W. Griffin (Provo, UT: Neal A. Maxwell Institute for Religious Scholarship, 2011), 287–312. For more information on the Gadianton robbers and their secret combinations, see David R. Benard, John W. Welch, and Daniel C. Peterson, “Secret Combinations,” in Reexploring the Book of Mormon: A Decade of New Research, ed. John W. Welch (Salt Lake City and Provo, UT: Deseret Book and FARMS, 1992), 227–229; John W. Welch and Kelly Ward, “Thieves and Robbers,” in Reexploring the Book of Mormon, 248–249; Book of Mormon Central, “Why Does the Book of Mormon Use the Phrase ‘Secret Combinations?’” KnoWhy 377 (October 31, 2017). Daniel C. Peterson, “The Gadianton Robbers as Guerrilla Warriors,” in Warfare in the Book of Mormon, 152. See Book of Mormon Central, “Why was Giddianhi So Polite? (3 Nephi 3:2),” KnoWhy 190 (September 19, 2016). 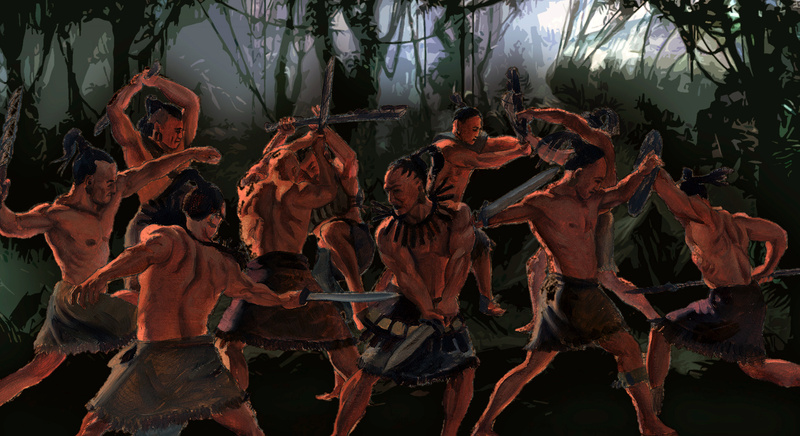 See Peterson, “The Gadianton Robbers as Guerrilla Warriors,” 158–162. Peterson, “The Gadianton Robbers as Guerrilla Warriors,” 163. See also, Book of Mormon Central, “How Realistic are Nephite Battle Strategies? (Alma 56:30),” KnoWhy 164 (August 12, 2016). Peterson, “The Gadianton Robbers as Guerrilla Warriors,” 167. Peterson, “The Gadianton Robbers as Guerrilla Warriors,” 147. Daniel C. Peterson, “Not Joseph’s, and Not Modern,” in Echoes and Evidences of the Book of Mormon, ed. Donald W. Parry, Daniel C. Peterson, and John W. Welch (Provo, UT: FARMS, 2002), 197. Ray C. Hillam, “The Gadianton Robbers and Protracted War,” BYU Studies Quarterly 15, no. 2 (1975): 221.